The slot machine game Jackpot Giant is powered by casino software developer Playtech and is a progressive jackpot game with 5 reels and 50 paylines. Playable from just 50p a spin, it has 2 bonus features where the giant flicks coins into the volcanoes to reward you with cash prizes. 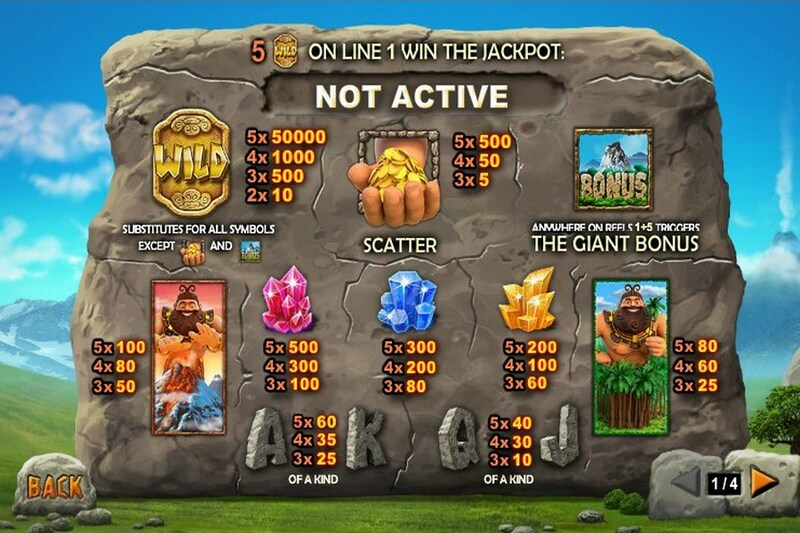 Look out for 5 wilds across payline 1 to win a life-changing jackpot! 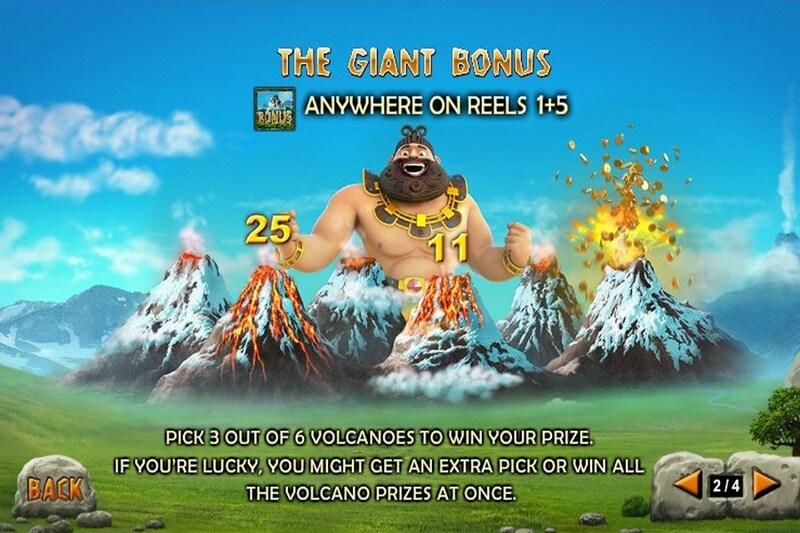 Jackpot Giant benefits from stacked slots symbols – you will see 2 variations of these stacked symbols of slot which show the giant himself behind a volcano and behind the trees. The stacked symbols will occupy 2 vertical reel positions and can give you lucrative wins. The Wild symbol is the golden plate with the word Wild written on it, and it can substitute for any other symbol in the game except for the scatter and the bonus. Also, if you land 2 or more of them on an enabled pay-line it will form its own winning combos. The Scatter symbol in the game is represented as the Giant’s hand filled with golden coins. The scatter symbol can form scatter wins if you land 3 or more of them anywhere on the reels, although these wins are not so significantly high. 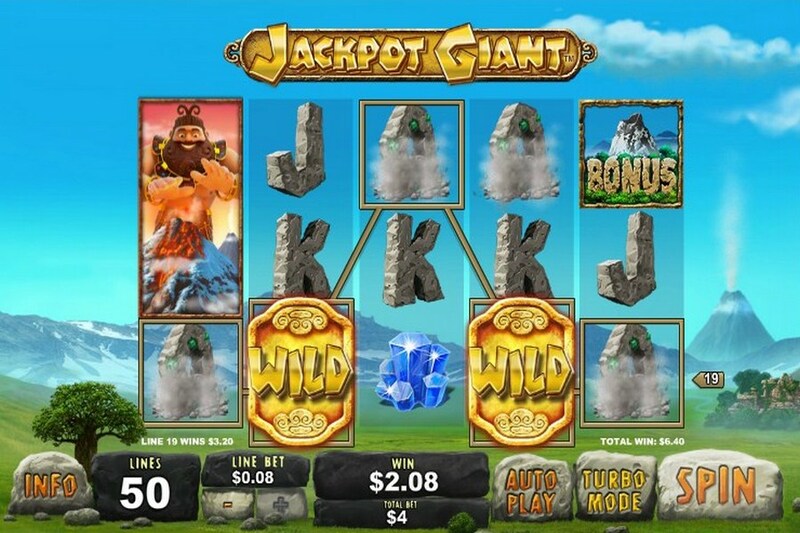 Slot machine game Jackpot Giant is a medium variance slot with the jackpot element. Graphics wise, its fun with the giant himself being quite fun to watch in the Giant Bonus feature.